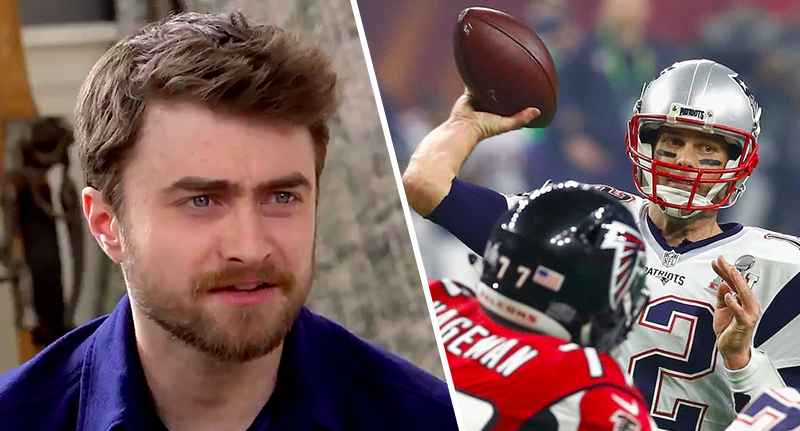 Daniel Radcliffe has publicly called out Tom Brady, the proud owner of a ‘Make America Great Again’ cap, for presumably being a Trump supporter. The red and white caps have become a symbol of all the things you either hate or love about Trump – and with the 45th President’s recent track record, after the government shutdown, you can understand why there’s a bit of animosity towards the ‘MAGA’ mission. But it’s fair to say not many people expected Harry Potter himself to thrown his wand into the three-ringed circus that is American politics right now. Speaking to Variety at Sundance Festival on Saturday 26 January, Radcliffe jokingly said he’ll be supporting the Los Angeles Rams in the 2019 Super Bowl since the New England Patriot’s star quarterback Tom Brady is a Trump supporter. Rams. Cause like the whole world is rooting against the Patriots…sorry. When asked if Tom Brady should retire he said no but joked that ‘he should stop winning things’. Take that MAGA hat out of your locker. I feel like that was the moment when as a country we were all like, ‘Come on, dude! You’re awesome… Don’t put that in here’. So Rams. I don’t know if they’re going to win but I want them to. In case you missed it, Brady gave an interview in 2015 speaking with the press from his locker room and a red ‘Make American Great Again’ hat was visible perched on a shelf in the backdrop. But after Trump attacked athletes who knelt or refused to sing during the national anthem prior to football games, considering the protest an act of defiance and lack of patriotism, Brady withdrew public support for the 45th. Meanwhile, a lot of people have criticised Radcliffe for publicly lambasting the political divisions in American when the situation back home in good ol’ Blight ain’t any better, really. Maybe that’s why the Imperium star has hot-footed it over to New York to live in his West Village of Lower Manhattan pad. Maybe it’s because he’s dating an American actor, Erin Darke, after they met on the set of Kill Your Darlings in 2013. Maybe he’s entitled to his own opinion. Maybe Brady is, too. The 2019 Super Bowl is scheduled for Sunday February 3 and will take place at the Mercedes-Benz Stadium in Atlanta.